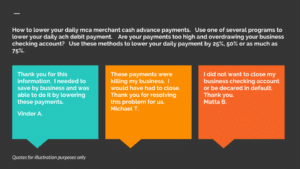 Do you need to lower daily mca merchant cash advance payments immediately? Is your account overdrawn because the mca companies keep debiting the daily payment? Do you have multiple advances and do not know what to do? What can you do? Apply for one of several options below that do not involve settlements, closing your bank account, being declared in default, nor having a cash advance company file a coj certificate of judgement against you. How to lower your daily mca merchant cash advance payments. Step 1 Negotiate with the mca merchant cash companies to extend the term and lower the payments. Offer to pay a lower amount for a longer amount of time. Step 2 Give the cash advance company solid reasons why you cannot pay the current daily advances. Step 3 Get an alternative loan or consolidation loan to payoff the advances. Step 4 Use the equity in assets such as a real estate loan or loan against equipment to payoff the advances. Get lower daily payments now without adverse action against you or your business. Can I get a monthly payment loan to pay these off? Yes. One of the ways to lower your daily mca merchant cash advance payments is to get an alternative loan to pay off the mca cash advances. By doing so, you will be lowering the payment because your monthly payment on the loan to pay off the mca’s will be much lower than the monthly amount you were paying on the daily cash advances. Usually, you will be paying 50% to 75% less if you are successful in securing a monthly loan to pay the mca’s off. 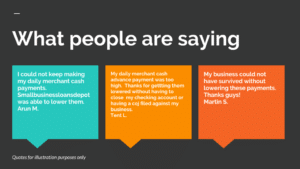 What if the cash advance companies do not want to lower the payments? You may have to push hard to get a concession. If your business had a true hardship, such as a hurricane or another type of hardship, make that known. If that fails, read the mca merchant cash advance contract in detail. Make sure you know exactly what can happen if you do not pay. It may be advisable to seek legal advice through an attorney if you know you cannot repay the advances. I cannot pay my advance. What can I do? Check your state laws to find out if your state has special protections and laws. Some laws vary by state. Negotiate with the cash advance company either directly final options may include bankruptcy. Should I get my Attorney to contact the mca merchant cash advance companies? Whether you should get an Attorney involved in talking with the cash advance companies varies on a case by case basis. In some cases, having your Attorney contact and negotiate with the cash advance companies is a good idea. If you are offering to work with the merchant cash advance companies and they are not working with you, this may be a good situation in which your attorney contacts them. 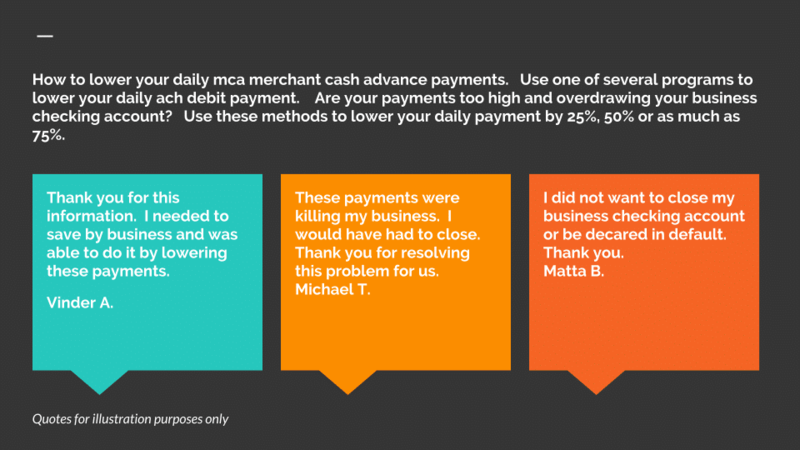 Some mca merchant cash advance companies are more willing to work with customers than others. If you do not feel comfortable negotiating or discussing your past due debt with mca merchant advance companies, this may be another reason to involve an Attorney. My daily mca merchant cash advance payment is too high. What can I do? “I need a lower daily merchant cash advance payment”. If one of these frequent requests applies to you, review several options here to lower your daily mca merchant cash advance payments safely and quickly. Complete the secure Docusign Secure DocuSign 30 Second Application here. Or call us at Tel: 1-919-771-4177, or Question? Contact us here. Is your daily merchant cash advance payment too high for you to survive? Solve your problem now. Avoid closing your business checking account and being declared in default. These lower daily payment options are safe. They typically prevent a coj certificate of judgment from being filed against your business when you act immediately. How are my payments lowered? Answer: The outflow of daily and weekly cash out of your business account is lowered by covering the debit of your existing advances until they are all paid. Your business is relieved of the merchant cash advance payments you are now making. Your business then pays a lower amount for a longer period of time. How much can I get my payments lowered? You can get the payment lowered 25% to 50% in most cases. Sometimes the payments can be lowered more, as much as 50% to 75%. I have more than 1 advance. Can I get my payment lowered on all of them? They may be lowered on all of them if you have 2 or 3 advances. I have several advances. Can you help me? Sometimes all of the advances cannot be lowered or eliminated immediately. You may be approved to lowering either most of them or all of them. The rest are lowered as you pay. There should not be any risks if you are approved for one of these programs and follow through on paying off the other advances. The biggest risk is not acting in time. Get rid of your mca merchant cash advance problem before it gets ahold of you. I am being told by my merchant cash advance company that I signed the contract and I have to make the payments I agreed do. Am I stuck? You are not stuck and there is also another option or two. You can pay them off or pay less. My daily mca merchant cash advance payment is too high. Can I get a monthly payment instead? You may qualify for a monthly payment program for enough to payoff the balances. Then you can payoff the merchants cash advances with the monthly payment loan. If your business does not qualify for a monthly payment, it may still benefit just as much with a weekly or daily payment. The total amount paid can still be lowered just as much. Get a lower daily payment today and also save your cash flow. Talk to a counselor today. What is average daily balance? How does it affect my getting a business loan? The average daily balance, also known as average ledger balance and average collected balance is the average of your daily balances for one month at your bank. If it is not high enough, it may be a reason for a decline with a lender who does not tell you what the requirement is. 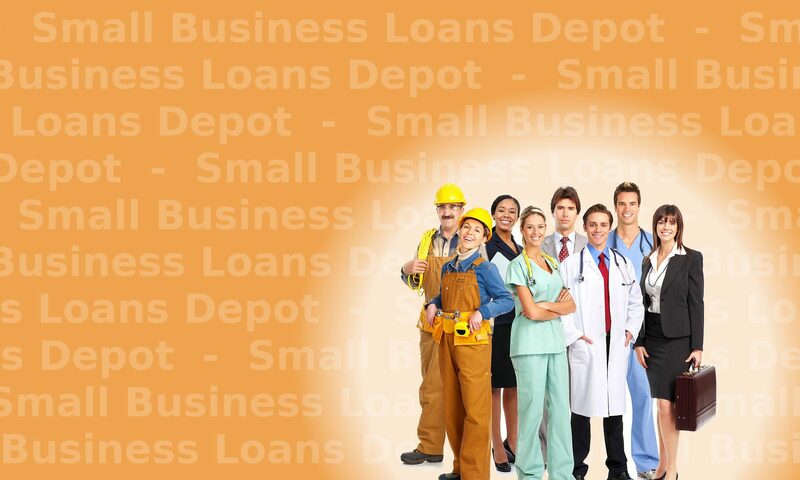 Or call us at Tel: 1-919-771-4177, or Get a business loan with a low average daily balance here. Why does the average daily balance matter? 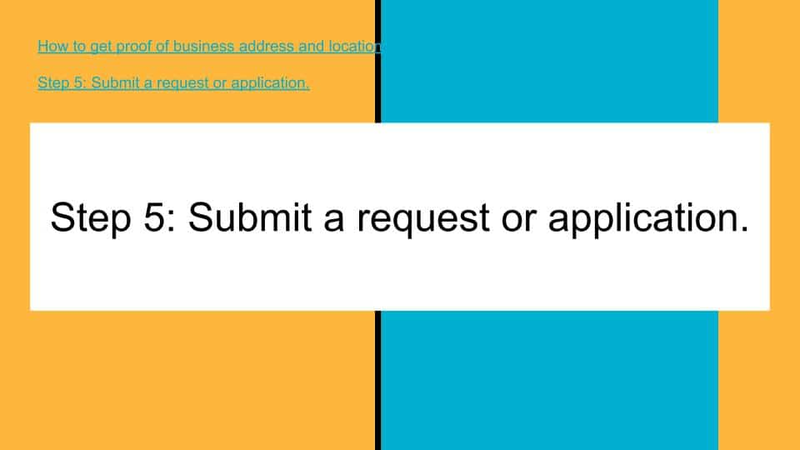 How does it affect my business loan request? If your average daily balance is too low, it can be a major factor in your business loan request being denied. Lenders have different numbers they look for in the average daily balance. However, most want to see an average balance of at least $1,000. Many want to see a $1,500 average ledger balance and some want as high as $2,500 average collected balance. Keeping high daily balances is too much for many businesses. Many businesses use almost all of the funds that are in their account immediately after it is deposited. If a business would leave deposited funds in their account longer, their average balances would increase significantly. What is average daily balance and why does it matter? Why do lenders care about average daily balances? Lenders, especially short term lenders want to know that you keep enough in your account than what the payment to them will be. The lower your average bank balance is, the more worried they are you will not be able to make payments to them. Customers sometimes call in who have been declined for this reason. They want to understanding this decline reason and also see what their other options are. They call in and say they were declined because they do not keep enough money in the bank. The problem usually is they take money out of their account as soon as they put it in. Many businesses that are declined for this reason may get declined for having less than $10,000 in deposits per month. Contact us for other options if your balances are usually low. There are specialty programs for this Apply now and click below. Click on the secure docusign application here. Or you can call us at Tel: 1-919-771-4177. Any questions? Tell us what do you want to do? We hope this information can assist you and also help you decide what to do next. Contact us or call us if you have any questions.